Inbox and Chrome users rejoice. 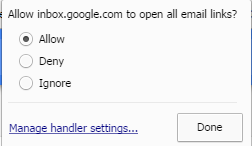 Users can now set Inbox as the default mail handler in chrome. What this means is anytime there is an email link on a web page, if set the handler to Inbox, when you click on that email, Inbox will open with a compose window already addressed to that sender. So how do you set this handler Chrome? Simply go to inbox.google.com and you will notice the protocol handler icon . Click on that and in the popup and select allow, then Done. If you ever want to turn this feature off, just follow the steps outlined here. the icon doesn't show up on my build. has it been removed from Chrome? Still shows for me. Try clearing your browser cache. Also look in chrome://settings and search for handlers. Under that setting make sure you have the option to let chrome ask. I think this should be made clearer: the handler icon is in the URL / address bar of Chrome, to the right of the URL you typed in (inbox.google.com), to the left of the bookmark "star". I should also note that this is the ONLY relevant search result when looking for information on how to make INBOX handle mailtos. There are lots of results for gmail, but it's hard to find any on Inbox. Thank you for writing it! Wow, such an easy answer and exactly what I needed! Thanks!